The US military involvement resulted in 56,220 Vietnam War casualties, according to the U.S. National Archives. The Vietnam War presents multiple challenges to historians due to official discrepancies with draft numbers, contention over official number of soldiers deployed, and a general lack of transparency from the US government during the war leading to possible misinformation in historical records. This is a comprehensive record set of military personnel who died as a result of the Vietnam War from June 6, 1956 to May 28, 2006. 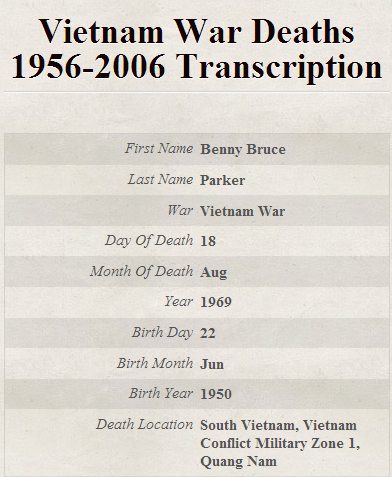 The Vietnam War Deaths index on findmypast.com compiled more than 52,000 transcripts of soldiers that died in service to their country. Original data compiled from National Archives Record Group 330: Records of the Office of the Secretary of Defense, 1921-2008. Compiled as part of the Defense Casualty Analysis System (DCAS) Extra Files.